Enjoy the sweet smells of the cotton candy and candy apples. Listen to the calliope music as you wander among the many stalls, to the screams of children enjoying the various rides. It’s all been designed to take your money, but you already know that. 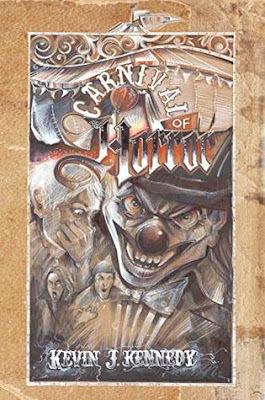 What you are not aware of, however, are the strange goings-on of the carnival world after dark. Do the carnies want more than your money? Does the fortune teller know more than she tells you? Are some of the games more dangerous than others? I definitely need a short story book by Kevin J. Kennedy, every once in a while. Especially the fact that these are horror stories, make them extra fun for me to read. I do hope this author will keep making books like this and I also hope that he will keep asking me to read them! Yay! Expectations: Since I've been reading a lot of books by Kevin J. Kennedy the last few years, I have high expectations when picking up a book. That can be a bad thing as well, but for now, this author is living up to the expectations! The short story books that he puts together always have some really good horror stories in it. Horror: This book is not for the faint of heart. Some stories are very gory, others are very creepy and you can expect that most of them don't end very well. I'm a huge horror fan and sadly I don't watch that much horror movies anymore, since I live alone and the movies still creep me out. But with these books by Kevin J. Kennedy, my hunger for horror is at rest, because I get a good dose of horror while reading these books. Good ones: The good stories in this book are VERY good. There are a few that were definitely my favorite, especially the one where a girl is downloading an app that can tell you the future, the creepy vibe was nice. I also liked a story about people who start to murder others for no reason, it was so gory! The final story in this book about a fruit-machine in one of the carnival tents was a great ending as well! Balance: Usually the scale in these books by Kevin J. Kennedy tips more to the side of good books. But in this book I found quite some stories that I didn't like that much. There was 1 that was so unclear to me that I skipped it. Luckily the good stories definitely made up to the ones that weren't that much to my liking! If you're a horror fan, I'd definitely recommend you read one of the books by Kevin J. Kennedy. The fact that it's all short stories, makes sure that every books has a story to your liking. I do expect a certain level of these books because this author spoiled me with such good stories! I'm so glad that the books live up to my expectations every time. Do you like horror books? I'd love to talk books, please let me know what you think of this book/review.